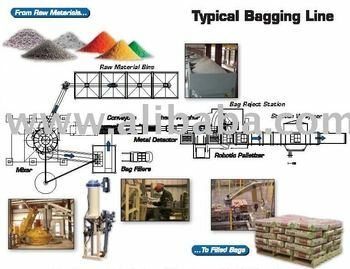 Complete Construction Materials Bagging/ Filling Line. Looking to bag your construction materials for transportation and/or storage at construction sites? Our packers bag up to 50kg bags of: Cements/ Aggragates/ Stuccos/ Gravel/ Readymix/ Sand etc.. Valve Bag Packers, conveyors and palletizing if required. From semi-automatic to automatic, we can help you.